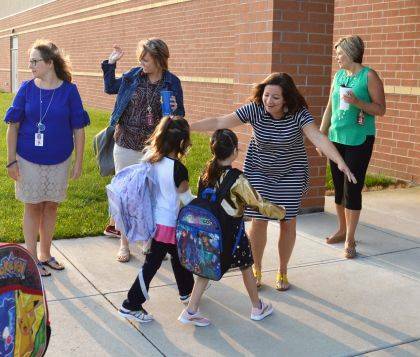 Indian Lake kindergarten teacher Jamie McClelland opens her arms for a big hug as former students, now first graders, make their way into the school building the first day of school. Elementary students high-fived and hugged staff members, while parents took pictures. Middle school students found the way to their wing of the building and settled in on the first day back to school. 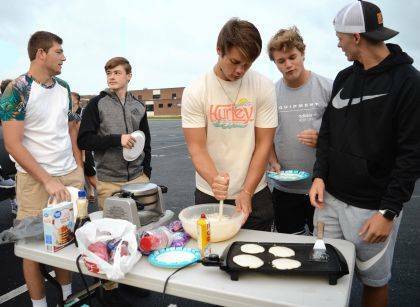 From left, Indian Lake seniors Jacob Zarnosky and Ethan Cummins wait patiently for juniors Nate Reichert, Ethan Parker and Clay Jacobs to serve up pancakes in the parking lot at the high school on the first day of classes. This is the third year of the high school tradition of pancakes on the first day of school.